I had the pleasure of sitting down for an interview with a couple of guys from The Maine back in October, and I asked them about how they felt about the outcome of Forever Halloween. I then asked about if they had any songs leftover that they didn’t get the chance to work with, bringing up the idea of releasing another b-sides EP or acoustic songs. So, I basically predicted the future. 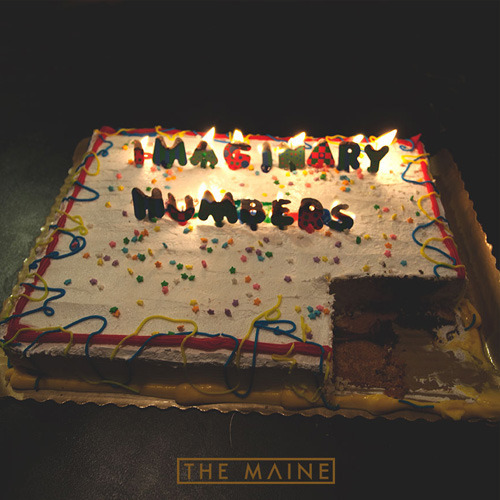 On Imaginary Numbers, the band continues their trend of growing maturity and slows themselves down, showing what they can do by stripping their songs down to bare bones. Opener “Raining in Paris” is gentle and soft, supported by an arrangement of guitar and quiet organ, followed by “Room With No Windows,” which backs the band’s usual cleverness and wit with swirling background vocals and plucky acoustics. The faintly-sung “Visions” grows with time, peaking near the end with a strong harmonica part before quietly transitioning into “Lonely Sad,” a near-seven-minute conclusion that almost collapses beneath the weight of itself. The loop of the piano and guitar throughout is both eerie and tranquilizing. While they would seem lazy or out of place in faster or plugged-in tracks, O’Callaghan’s flattened vocals fit perfectly with the feel of the song. Midpoint “Perfectly Out of Key” is the highlight of Imaginary Numbers; a beautiful piano ballad, carried by a delicate falsetto and personal, harsh lyrics. At this point in their career, The Maine are starting to pick up a lot of speed. Over the span of their past few releases, they’ve strongly come into their element and are becoming one of the better bands within their genre. Imaginary Numbers is a step out of the group’s comfort zone, but with the performances here, you wouldn’t guess that this isn’t their usual song and dance. Next Entry Labyrinth Clothing GIVEAWAY! !